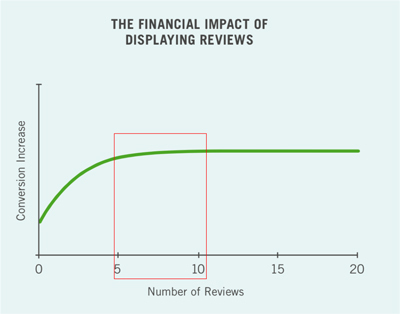 Do more online reviews equal more revenue? Whether you’re running a B2B or B2C site, cleverly designed online reviews can make a huge difference to your bottom line. While the figures may differ from study to study, there’s no doubt that online reviews boost conversion rates, sales figures and customer retention rates. When customers buy from a brick-and-mortar store, they’re able to get a good sense of that business. They can examine a selection of products and interact with the staff, all of which helps them build trust in the brand. When they’re buying from a B2B or B2C e-commerce store though, they only have the images and information you have chosen to put online – as well as the reviews. Reviews build trust. Objective online reviews give customers added confidence in your business and in your products. One study shows that 88% of consumers, especially Millennials, give online reviews as much credibility as personal recommendations. An added benefit is that reviews also make you easier to find. Online reviews boost your search engine rankings as they continually add new and unique content to your site. Also, many people start researching a new purchase by typing in “[product name]+review”. Either way, you’ll be right up there on the search results. Trust boosts sales. When people trust you, they are much more likely to buy from you, boosting your sales by an average of 18%. This is particularly true when those products have a higher price tag or a large impact on the customer’s life. Satisfied customers lead to increased retention. When you’ve helped people select the right product for them, and made purchasing it a pleasure, they’ll be back to buy from you again. Therefore, online reviews equal more revenue – when more people find you, then regularly buy from you, your bottom line benefits. Although any online reviews are better than nothing, there are several factors that influence how well they work for you. While star ratings themselves are a big plus, ironically, consumers tend to trust your products less if they’re all rated 5/5. A recent study by the Spiegel Research Centre found that the most popular items actually sit in the 4.0 – 4.7 range. 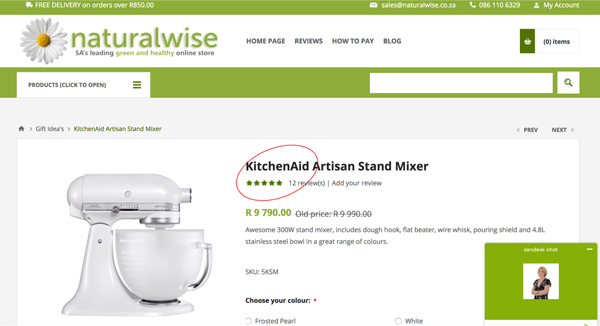 What to do: Encourage honest product ratings and make sure those ratings are easily visible. The Spiegel study also showed that the first 5 reviews make the biggest difference to sales, increasing them nearly four-fold. The impact then tapers off up to 10 reviews. Also, products with a high price tag need at least 5 reviews, while conversions of lower-priced products are positively impacted with just 2 to 4 reviews. What to do: Identify which products will give you the best returns with the addition of reviews. Prioritise these and put strategies in place to encourage your customers to review them. Let customers decide how helpful a review is and then sort your reviews from most helpful to least helpful. Amazon increased their revenue by $2.7 billion by implementing this on their website. While displaying perfect reviews all round generates scepticism, including some negative ones demonstrates transparency and builds trust. Obviously too many (3 or more, according to Lightspeed Research) will harm your reputation, but a few negative product reviews can actually increase conversions. When they see them, many customers will spend more time on your site searching for a similar product with better reviews. What to do: Display some negative reviews if you receive them. Professionally respond to negative reviews – it displays great customer service. And if you receive too many, take action to fix the product or service. “Verified buyers” are B2B or B2C consumers who have bought something, received a follow-up request for a review and provided one. These prompted reviews often generate 4- or 5-star ratings, and many consumers trust them enough to buy on the strength of them. “Unprompted” reviews come from consumers, often anonymously, who may or may not have bought from you. These ratings are often 1- or 2-star, and other consumers trust them less. 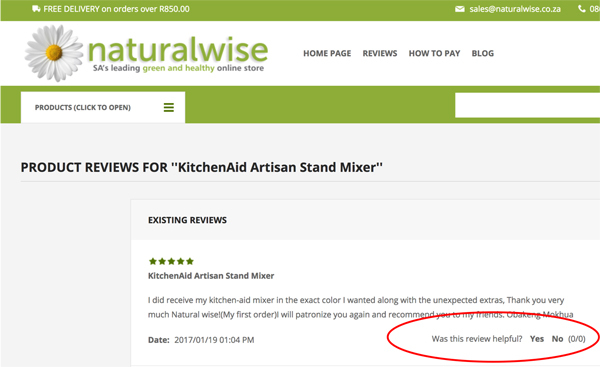 What to do: Request a review after every purchase, and make it clear on your site which reviews are from verified buyers. If you format your reviews correctly, search results will display “rich snippets”, full of useful information for a potential customer. For example, visible star ratings help your offering to stand out from the crowd and increase your click-through rate. What to do: Use a tool like Schema.org to structure your pages so search engines can easily find the information they need. Comalytics software has this functionality – ask us how to use it. The example below is from one of our clients, Naturalwise. Whether you’re selling B2B or B2C, offer samples of a new product to new or current customers, then follow up asking them to document their opinion in a review. Gather customer email addresses (ensuring you get permission from them) when they purchase from you. Then give them just enough time to try out the product before sending a review request email. These are specifically designed for reviews and rich in related functionality. At Comalytics we can integrate your B2B or B2C site to Yotpo on request. Other options you might find elsewhere are Reevoo or Bazaarvoice. This works through setting up rules for emails to be sent under certain conditions. For example, a review request email might go out a certain number of days after a customer purchases a product. While this kind of software isn’t specifically designed for reviews, it gets the job done and also offers other very useful marketing and customer service functionality. At Comalytics, we integrate on request to ContactPigeon. Respond with as few clicks as possible, from any device, preferably without even leaving their mailbox. Make their process very intuitive and easy – the moment they struggle, they won’t leave a review. Get creative and share their review (and perhaps even a selfie with your product) on social media platforms. Yotpo makes this simple for instance. Prompted reviews from verified buyers can have a massively positive effect on your B2B or B2C business’s bottom line. Following a few rules and automating the process will maximise this for you. Online reviews really do equal more revenue. Contact us to help you integrate to a review package or ask us about our review plug-ins. Have you experienced an online review process that was so well designed you were excited to take part in it?